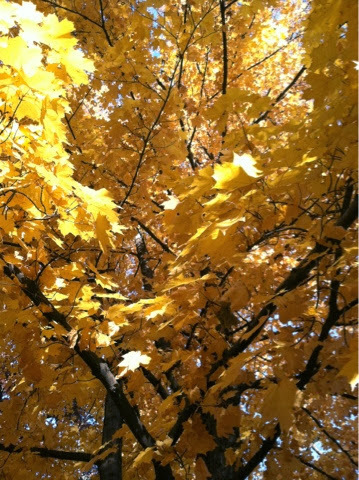 I loved these gorgeous yellow trees! It felt great to be back racing after a 2 week hiatus. The weather was better than expected for November and the trees at Devils Glen Park were absolutely gorgeous. Three deer even decided to join in on the fun during the men’s race. Luckily the men were on the other side of the course at the time! At the start line for the Women’s Open, all seven of us were Iowa City women (one was actually from Cedar Rapids, but she races for an Iowa City team), not a single lady from the Quad Cities. It reminded me of how lucky I am to live in Iowa City and have such a wonderful cycling community filled with both genders! The start of our race was fairly fast and we all took off chasing Britt, trying to stay with her as long as possible. I had another good start and was in 2nd place going into the first set of barriers. I managed to stay in 2nd place for the first twisty and technical lap, with Lisa D. and Cara right behind. Lisa took over 2nd place as we were coming through the start/finish going into the the second lap, but she, Cara, and I remained within about 15-30 seconds of each other. The lap cards showed us four laps to go. It was a long course and I was worried I wouldn’t be able to hold 3rd place that long. It was a really fun course though with all the twisty sections mixed in with plenty of rocket fast straightaways, semi-scary off camber sections, and a few steep climbs. Oh and some of sections had fallen acorns on them, making the off camber areas and turns extra exciting. Throughout the next four laps I focused on not sliding out! And all three of us remained close, still fluctuating around 15-30 seconds ahead or behind one another. It was really fun to have someone so close ahead and so close behind to really push me. Too often things get spread out a lot farther and it’s harder to keep racing all out the whole time. I tried to bridge the small gap up to Lisa and wish I would have carried a little more sped in certain sections, but there was also plenty of course tape down, making me think that maybe it was good I didn’t. I did have some trouble on an uphill remount, with two laps to go, but at the other barriers I was able to do some remounts without a stutter step which was pretty exciting. I never managed to catch up to Lisa and finished in 3rd place. Overall I’m really happy with how I raced and am now looking forward to Jingle Cross this Friday, Saturday, and Sunday!